Young John saved all his money and when into partnership with James Henderson as publicans in the summer of 1892, in premises at 149-151 Oxford Street in the southside of the city named the "Glenleven." Mr James Henderson the senior partner in the firm was born in Ayrshire and was educated in the old masonic village of Kilwinning. When James came to Glasgow he entered into the licensed trade in the south side of the city a trade that he was connected with for years. The Glenleven Bar in Oxford Street with John Eadie on the Left and James Henderson on the right. 1892. James and John traded under the title of Henderson & Eadie. John was only only 25 years of age. At that time he learned so much in the trade from his partner, he was born with the gift that he could communicate well with the public and all who met him had nothing bad to say about him. As a people person the locals liked him very much, a gift that worked very well in his favour as a publican. The old pub in Oxford Street was gutted and altered into one of the best bars in the area. Only William Younger & Co., ninety shilling ale was stocked. A special blend of "Glenleven" whisky was much sot after, a 7 year whisky , matured in sherry casks, distilled by Messrs. Haig & Co, Markinch. The following year John was married to Elizabeth Maxwell Black on December 1893 in a Church in Blythswood, the reception was held at the Alexandra Hotel, Bath Street, Glasgow and their honeymoon was spent in the beautiful Blackford Hotel, Perthshire. The happy couple started a family at 6 Regent Park Terrace, Glasgow. Their first child Mary was born in 1894, Janet was born in 1896, Lily was born in 1897, Elizabeth was born in 1899, John was born in 1902, Isabella was born in 1904 and James was born in 1905, James was known as Noel by his family as he was born on Christmas day. Henderson & Eadie expanded the business in the following year and occupied the long established licensed premises at 84 Caledonia Road, Gorbals, Glasgow, however the partnership didn't last that long, John went on his own and kept the Glenleven Bar in Caledonia Road while Mr Henderson kept the Glenleven in Oxford Street. As sole proprietor of the Caledonia Road premises John changed the name above the door to John Eadie with "Wines & Spirits" on either side of his name. John Eadie was well known in the licensed trade by now, he was a member of various clubs, societies and organisation's including a Burgess of the City of Glasgow (J.P.) a member of the Incorporation of Weavers which he joined in 1900, Grand Antiquity Society, the Southern Merchants, the Thistle Burns Club, the Scottish Furniture Trades Benevolent Association, the Kareless Klub. The Organisation however in which he took special interest was the Scottish wine & Spirit Merchants Benevolent Institution. After serving on the board of Directors for a number of years was elected president in 1912, in 1931 he was elected treasurer. He gave much of his time and service in the Institution, his service and guidance contributed largely to its success. The Kareless Klub, 1920s, left to right front row J Vallance, John Warnock, 568 Springburn Road, John Eadie, 418 Rutherglen Road, 12 Bridge Street, 171 Watt Street, 84 Caledonia Road, 71 West Scotland Street, James M Maitland, J M Forrester, George Thomson, Harry MacDonald. Back row J S Kerr, 100 Crown Street, George Carrick, Black Bull Inn, 120 Main Street, Maryhill, Thomas W Lang, 483 Cathedral Street, 271 Argyle Street, W B Johnston, Horse Shoe Bar, 164 Crown Street, 16 Dowanhill Street, Charles W Mayger, Joseph Robb, 2 Cromwell Street, 49 Helen Street and Tom W Hogg, 519 Dumbarton Road. Members of the Kareless Klub photographed at the house of Mr J M Ironside, Dumblane, 1937. On the occasion of their annual outing. Left to right seated are Mr Thomas Reid, John Vallance, James Maitland, George Thomson, Issac Clark and Alexander Lawson. 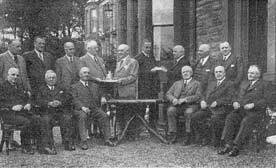 Standing are Mr T W Hogg, Jack Wingate, T A B Sherriff, Joseph Robb (receiving a cocktail set,) James M Ironside, Thomas W Lang (receiving a cigarette box,) John Eadie, R H Clark and Mr W J Marshall. An interesting coincidence was associated with the annual outing and general meeting of the members of the Klub, a small coterie of well-known members of the licensed trade in Glasgow. This year two of the past presidents, Mr Thomas W Lang, who was the secretary and Mr Joseph Robb, celebrate their silver wedding and to mark the occasion both were honoured with gifts. Mr Lang received a solid silver cigarette case, at the hands of Mr John Eadie, while Mr Robb received a handsome cocktail set, formerly presented by Mr James M Ironside. The presentations were made when the company foregathered at the home of Mr Ironside at Dumblane, after a pleasant journey from Glasgow. Following the ceremony and the hospitality of Mr Ironside, the party re-embarked on their bus and proceeded to the Breadalbane Arms Hotel, St. Fillans, where lunch was served and the journey there resumed to Messrs Lang's Glengoyne Distillery where the business of the day was disposed of. Mr Ironside, the president occupied the chair and after Mr Lang had read the minutes from the last meeting, a humorous account of the previous years outing and meeting. Mr T A B Sherriff, Bowmore Distillery Ltd, was elected president and Mr T C Reid vice-president, tea and the usual exchange of compliments followed. The Kareless Klub. 1936, photographed at the Victoria Hotel. 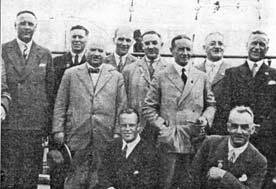 Included right to left seated... A Lawson, George Thomson, James M Ironside, George A Shearer, John Eadie and Thomas W Lang. standing Alexander Melville (guest), James Maitland, Issac Clark, James C Gray (guest), J Vallance, Joe Muir (guest), Joe Robb, T W Hogg, T A B Sherriff and W J Marshall. This year's outing was a rare occasion, because it was the golden jubilee of the Kareless Klub, and the fiftieth excursion. 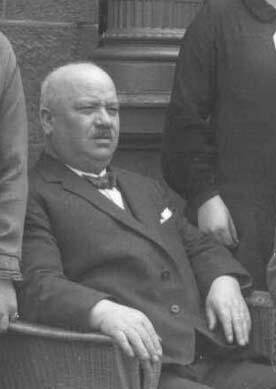 Mr George Shearer, president of the Klub headed the event, they set out from Glasgow in a comfortable coach on the first Thursday of June 1936. At his home in Dumblane, Mr Ironside, the vice-president received the party and after refreshments introduced the new comers to his aunt, Mrs Henderson a lady of advanced years but of lively intelligence and his sisters. Mrs Henderson had previously met most of the members of the Klub when residing at Woodside Hotel, Douce, while that hostelry was carried on by Mr Ironside and his wife, that seemed to have become a ritual, the presentation of a box of chocolates to Mrs Henderson, was duly carried out by Mr Shearer. The younger ladies were similarly honoured at the hands of Mr Lang. The health of the ladies, and of the new home was heartily pledged. Resuming the journey, with Mr Ironside now a member of the party, the excursionists made on to Perth, where at the Victoria Hotel, they were welcomed by Mr Alexander Hinshaw. After the photograph above was taken a first class luncheon was served. An invitation to luncheon had been extended to Mr Joseph Muir, a well-known member of the trade in Perth and a past president of the Glasgow Licensed Trade Defence Association., and bidding him welcome to the feast. 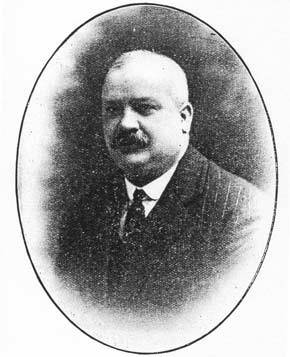 Mr Shearer and Mr Muir had rendered great service to the trade particularly in 1920 when the first big Local Veto fight took place. That was when Mr Shearer first met Mr Muir, and the friendship then started had continued ever since. After luncheon the afternoon was spent in Crieff, Comrie, St. Fillans, Lochearnhead and round by the pass of Leny and Port of Monteith to Drumgoyne, where at the Glengoyne Distillery of Messrs Lang Bro's Ltd, where the Klub was first constituted a halt was made for tea and subsequently, the business meeting and election of office bearers. At the onset Mr Shearer, who presided, referred to the death of an old and esteemed member of the Klub in the person of Mr Peter McDonald. They very greatly deplored his passing at the age of Ninety. Thereafter Mr Lang read the minutes and rather Kronicles of the last outing and meeting of the Klub. In moving the election of Mr James Ironside as president for the ensuing year, Mr Shearer said he had very much enjoyed his occupancy of the chair. He was very much indebted to Mr Lang and Mr Eadie for relieving him of many of the duties which he should have undertaken and especially for making the arrangements for the days outing. In 1900 Mr Eadie secured the licence for premises at 12 Bridge Street which he opened in 1901. He soon expanded his small empire of public houses including 418 Rutherglen Road, 69 Eglinton Street, (which became known as the Station Bar); 171 Watt Street, 84 Caledonia Road, ( which became known as Treanors Bar); 71 West Scotland Street, all of which he had his name above the door. His brother James was employed to help run the business, James became licensee of 69 Eglinton Street and 275-77 Cumberland Street, 358 Gallowgate ( the Falls of Clyde). John Eadie moved home to 85 Maxwell Drive in the southside of the city before moving to the Grangeknowe, 60 Aytoun Road with his family. Mr Eadie wasn't just a publican he was a Wine & Sprit Merchant, he became a director of R W Cairns, 5 Miller Street Glasgow a pub which still stands today and known as Cairns. The old firm of R W Cairns started when Robert W Cairns was employed by Thomas Cansh & Co at their premises at 5-9 Miller Street, in the city centre. Thomas Cansh branched out in 1871 and opened new premises at 130 Buchanan Street. A few years later he took over a pub at 186 Argyle Street which became known as the Grant Arms at the Hielan 'mans Umbrella. 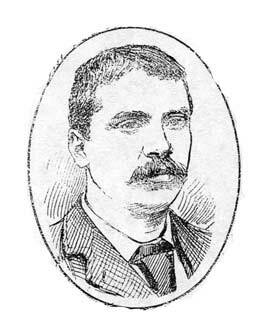 Thomas employed Robert Webster Cairns who became manager for the company. On the death of Mr Cansh, Robert became sole proprietor. In 1894 he sold the Argyle Street business to Finlay Bell of Chrystall Bell & Co for £1,000. 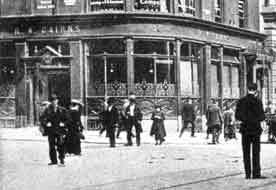 Months later Mr Cairns died leaving his brothers Alexander as licensee of the Miller Street premises and David as landlord of the Buchanan Street pub. The Cairns family then took on John Eadie as a partner to inject some youthful expansion into the company. In 1893 Alexander Chesser was the cellar man in Miller Street premises. Sandy as he was known ,was an old mariner, he was in charge of the very busy cellar of Cairns, Miller Street. At the age of 57, he spent most of his time at sea visiting Iceland to India. He came ashore in 1886 and went into the employed of Messrs Cairns. Mr Alexander Chesser familiarly known as Sandy. 1894. Robert W Cairns was born at Stonehaven, Kincardinshire, it was Mr Cairns that introduced English Beers into Miller Street. He died in 1894 and left the business to his brothers Alexander and David. 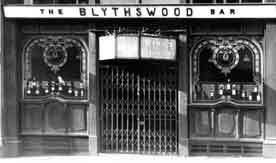 Another famous pub in the city was the Blythswood Bar in Hope Street, there was a Eadie family connection with this pub. John Eadie's eldest daughter Mary married William Wright the proprietor of the Blythswood Bar in 1918. When William died Mary was left to run the business. She was re-married in 1930 to Joseph Milne, her son John A Milne became licensee of the business. The Blythswood Bar, Hope Street. The read more on the Blythswood Bar Click here. 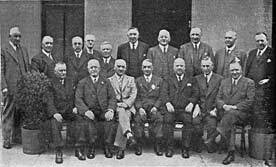 A few of the outstanding figures of the Benevolent Institution snapped on the quay at Ardrishaig on the occasion of the annual outing in June 1933. 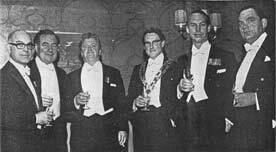 Included in the group are Mr John Gordon, C E Cotching (president), J Ralph Hopking Past president), John Eadie (hon. treasurer), William Brechin (director), William Walker (past president), J W S Hutchison (director), Joseph Robb (director), John Paterson (vice-president), and in front Mr Ronald Teacher (director) and George Shearer (past president). John Eadie died in his sleep on 9th August 1938 at his home in Ayouton Road, Pollokshields, Glasgow. The licensed trade in the west of Scotland lost a valued member and a very good friend. He achieved very much in his early days in the trade in such a short period in time. His wife died two years previous and left a family of 2 sons and 5 daughters. He was laid to rest in Eastwood Cemetery. Hundreds of mourners lined the street to past respect on one of the best known members in the trade. 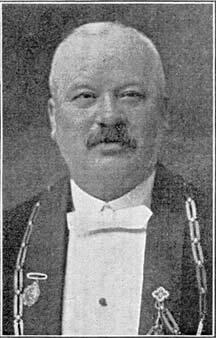 During his life he was a member of various societies including nearly twenty years as director of the Scottish Licenses Mutual Insurance Association Ltd. A J.P. for Glasgow. The annual staff dance of the One-O-One restaurant, Hope Street, Glasgow took place in the Cadoro restaurant, Union Street in 1954. Left to right front row... Mrs Edna Milne; Mr C Reynolds (manager),; Mrs Reynolds; Mrs Mary Milne (proprietress); Mr Milne and Mr Forbes Clark. Amongst others in the image are A Mr M McLean (accountant and organiser of the dance); Miss Elspeth Milne; Mr Robert Eadie; Mrs Eadie; Mr J Maitland Mackie (James Buchanan & Co Ltd); Mrs Mackie; Messrs D Baxter and W R Mort (William Younger & Co Ltd); and Mr Forbes Clark. The One-O-One restaurant was an extension of the Blythswood Bar which was next door to the bar. Mr Robert Webster Bruce Eadie, licensee of the Station Bar, Eglinton Street. 1957. Robert W B Eadie owned a pub on the Gallowgate for over ten years, many will remember this old pub as the White Elephant. The White Elephant, 338 Gallowgate. Pictured here at the annual Burns night of the Thistle Burns Club, Glasgow 1957. Left to right Mr Williamson, manager of the Locarno Club; S W Briginshaw, manager of the Piccadilly Club; Walter Myron, of Sloan's restaurant; Gordon M Ross director of William Grant & Sons Ltd; A Crawford of William, Grant & Sons Ltd; G Hunter, president of the Thistle Burns Club; A K Hardie, president of the Royalty Burns Club; R McLean, of the St. Mungo Vintners Ltd; R W B Eadie, vice-president of the Thistle Burns Club; and Mr J C Maitland, licensee in Howard Street, Glasgow. 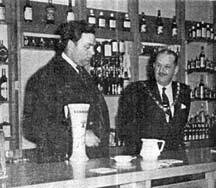 The Provost Opens the Ardeer Tavern 1960. Mrs M Milne, the licence-holder, and her son Mr John E Milne look on as Provost J Forbe declares the new Ardeer Tavern open. A handsome and spacious new tavern was opened at Ardeer Crescent, Ardeer, Stevenson, when the directors of Ardeer Tavern Ltd, in association with M Milne Ltd, were hosts to about 40 guests. The new tavern was adjacent to the former public house premises which had been opened in 1861 and which the late Mr John Eadie had been associated for about 50 years he was succeeded there by his son also John Eadie and by the latter's sister, Mrs M Milne, who no held the licence for the new premises. Her son John E Milne, welcomed the company at the opening ceremony. He extended a special welcome to Mr William Henderson, the family's oldest customer, his custom dated back to 1896 when the Eadie family had premises in Miller Street, Glasgow and to Mr Peter MacDonald, who had been a friend of Mr Milne's grandfather. The opening ceremony was performed by Provost Homes Forbe, chairman of the Ayrshire Northern District Licensing Courts. The premises consisted of a lounge bar, public bar and an off-sales department formerly called the family department. The lounge bar, in addition having an adjoining entrance from the public bar, has a separate entrance from the street. The colour scheme in both bars is attractive. In the lounge a fitted carpet in various colours and pale helio walls and a lilac ceiling present a pleasing effect. Flanking the walnut and peach mirror gantry are mural paintings in French design. Dove grey and citron yellow formica are used effectively in the bar counter, the front of which is finished in walnut and sycamore. The tables are also topped in citron yellow and dove grey formica. This spacious lounge is amply provided with comfortable seating in powder blue, dove grey and Spanish red leather. A mural of the Cottar's Saturday Night and a gantry peach mirror depicting Burn's Cottage as it formerly was, are notable features of the public bar. Over the bar itself is an illuminated turquoise canopy. The decorative floor has random tiles in red, blue and biscuit colour. There is Spanish red leather seating, above which are grey walls and a primrose ceiling. Another pub was opened in 1961 called the Amphora in Sauchiehall Street, managing director of R W Cairns, John Milne opened the new venture. The Amphora, was in fact, a resuscitation of the Cairns House which until the previous year, was so popular a feature at the corner of Buchanan Street and St. Vincent Place. To see interior views of the Amphora and what other names it had click here. R W Cairns. Sat at the corner of 130 Buchanan Street and St. Vincent Place. circa 1900. Another view of R W Cairns, 130 Buchanan Street, also known as the Cairns House. These old premises were demolished in 1960. 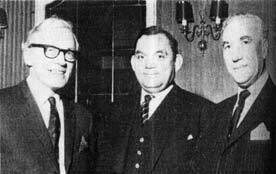 At the opening of the Grangeknowe Inn, Stevenson in 1964, were Mr John Eadie Milne (left), managing director of the proprietor R W Cairns Ltd and Provost James Clements of Stevenson who performed the opening ceremony. These premises were opened in the summer of 1964. Note the name Grangeknowe was the name of the family home. Exterior view of the Millwheel Bar in Bridge of Weir 1968. The commercial Inn, Bridge of Weir was bought by R W Cairns Ltd around 1966, it had an overhaul, and a new name " The Millwheel." The new lounge bar, named the Grist Mill, meaning 6 Sheaves of Corn has been built on the site of an old cottage. The lounge could hold some 100 people. The interior was white washed walls, a grain chute and sacks of corn set into the frontage of the bar. The lighting, in keeping with the general mood, has replicas of old barn lights. , storm lights and metal chandeliers.The lounge bar has one other unusual feature, it will serve three types of draught beer, heavy, Guinness and lager. The public bar of the Millwheel remains much the same except for a slight extension, but will benefit from the new central heating system installed. In the public bar, there is the last remaining chair of a set of Jacobean chairs from the original Inn. This one dates 1677. 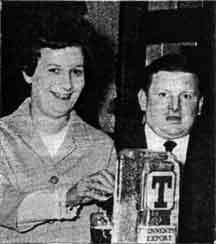 Manager of "Millwheel" was Mr J McAllister, his wife is seen pouring a pint of Tennents lager. 1968. 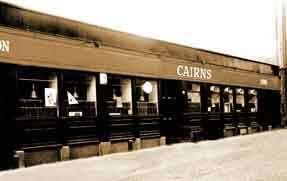 In the same year another establishment was opened by R W Cairns, the Railway Inn, Busby. The newly renovated Railway Inn in Busby has a bar with a difference. First granted a licence in 1820, the Inn was taken over in 1965 by R W Cairns, who together with their architect have now completely rebuilt the public bar in first class railway style. Inside, the historic atmosphere has been preserved, many interesting and exciting relics of the railway are set against a pleasant relaxing background. Some parts have kindly been donated by Mr A Stewart of Alex. D. Stewart, Metal Merchants, Shieldhall Works. Keeping in the railway trend, the ceiling is dark oak slatted to give a tunnel like effect.. In contrast the gantry was a full side section of a goods wagon painted in brilliant orange with dark wood cross beams. Another wall was covered with Ballachulish slates, a restful setting of tan coloured chairs and rust carpet, all complimented by lighting which had been cleverly arranged by using original carriage and engine lamps. Many other fascinating railway souvenirs were incorporated including buffers, sleepers and the plaque from the engine used recently to commemorate the 21st birthday of East Kilbride which coincided with the centenary of the first train to run from Busby to East Kilbride by the Caledonian Railway Company. A number of trade personalities are seen in this group, pictured on the occasion of the annual Burns Supper of the Thistle Burns Club in the Grosvenor Restaurant, Glasgow, 1962. 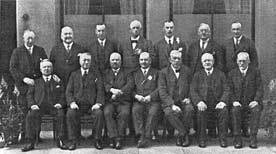 Left to right in the front row are J K Webster, (Royalty Burns Club) his premises were at 27 Norfolk Street; D A Maclean, (president of the Royalty Burns Club); A M Loudon, (president Thistle Club); R W B Eadie, (past president Thistle Club); J Young, (secretary Thistle Club); J H Wylie, (vice-president Royalty Club) of Booth's Gin. The group also included D Mclean, St. Mungo Vintners; M Haxton, (past president Royalty Club) he had the Montgomery Arms Bar Hotel, East Kilbride; A McAulay, (Royalty Burns Club) he had bar 69, Govan Road; R Meiklem, (Royalty Club); J McAulay, (Royalty Club) Carmunnock; A E Kilgore of Cantrell and Cochrane; Councillor W Cockburn, (Royalty Club); J McIntosh, (secretary Royalty Club) of G & C Moore Ltd. In the centre is Mr John E Milne with J M Martin (White Horse Distillery) and J R B Kean (Scottish and Newcastle Breweries). Image taken during the presentation of Alexander M Don nas new president of the Scottish Wine and Spirit Merchants Benevolent Institution in 1971. Mr John T C Eadie. 1923. Mr John T C Eadie was the second son of James Eadie of Barrow Hall, Derby, the founder of the firm of Messrs James Eadie Ltd, Brewery, Burton-on-Trent. 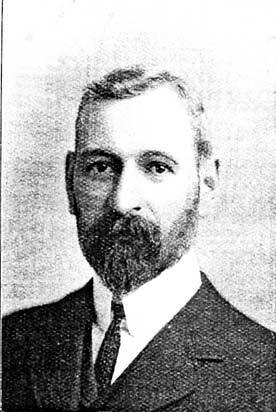 Mr John T C Eadie was a director in the firm and was in his 62nd year when he died in 1923. The brewing trade and agriculture had lost a distinguished figure, he was a member in the council of the premier administrative body. The Royal Agricultural Society of England. Mr Eadie occupied a high position and he had officiated as a judge at the great national meetings, particularly of Shire Horses. John T C Eadie was a cousin of John Eadie. In 1891 Cairns Bar in Miller Street was described as one of the most comfortable and best equipped bars in the city of Glasgow. On a Saturday night or indeed, any night of the week except that of the first day of the week, the scene here is a singularly lively one, and presents aspects not observable in any of our first-class establishments. The spacious room behind the bar, where every newspaper of any note lies in profusion on the tables and on the racks, is a model of completeness. The guest toucher, without rising from his seat, an electric button, and the waiter turns up with a punctuality that is suggestive of automats. Although the room is not a free-and-easy, still it possesses features which surpass any free-and-easy that we ever visited. The staff of waiters is exceptionally smart, and civility is one of the cardinal virtues which Mr Cairns not only insists upon in his staff but in those who patronise him. The best whiskies and richest beers are always to be had here. Special Thanks to Andrew Eadie "Good Luck with your Essay"
See other Glenleven Bars CLICK HERE. R W Cairns opened new offices and a new public bar and lounge- restaurant at 74 Kirkintilloch Road, Bishopbriggs, Glasgow. 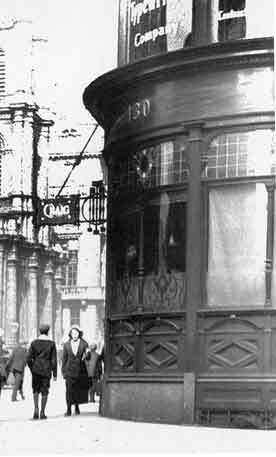 which still stands today and is known as the Briggs Bar. Tel: 0141 762-2288. In the early part of John Milne's period as chairman of the Eadie-Cairns Group as it was then known, was a time of rapid expansion. Apart from the pubs they dealt in off-sales, wholesales, distribution, whisky distilling and exporting, including the acquisition of the Auchentoshan Distillery in 1969. In 1948 the company underwent a series of changes- the company name changed back to R W Cairns Ltd and some of the assets were sold to Stanley P Morrison Ltd, Alloa Breweries Ltd and Victoria Wines Ltd. In 1990 the slimmed down version of the company moved its headquarters from the city of Glasgow and built new offices and a large pub in Bishopbriggs. John E Milne died in 1974, his widow Mrs Jean Milne was left to run a business she had little experience of, her son Mr James Willis stepped in to improve the business, he still runs the empire today. The family business also owned the well-known Kirkhouse Inn, Strathblane. Cairns Scotch whisky "Eadie Cairns" is a 12 year old Royal Memorial, Deluxe Blended Whisky. Off-sales were opened in Waterloo Street, Glasgow. R W Cairns lived at Cairnbank, New Killpatrick in 1881. Alexander B Cairns lived at 14 Matilda Terrace, Strathbuno before moving to 15 Nithsdale Road, Strathbungo in 1897. His brother David Cairns lived at 22 Arlington Street before moving to 14 Wilton Mansions, Glasgow. in 1897. In 1897 Robert Cairns and his son Robert jun., were Commission Agents at 12 Miller Street, Glasgow, they lived at 88 Dixon Avenue, Glasgow in the southside of the city. There were also an Eadie family living and working in Cambuslang. They owned the Tavern on Main Street. 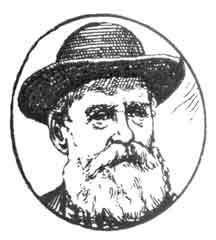 William Eadie was the proprietor for many years. *In 1863 there was a Mr Robert Eadie trading as a wine & spirit merchant at 498 Gallowgate he may have been a relative. There was also a Robert Trading at 962 Pollokshaws Road in the southside of the city in 1893.